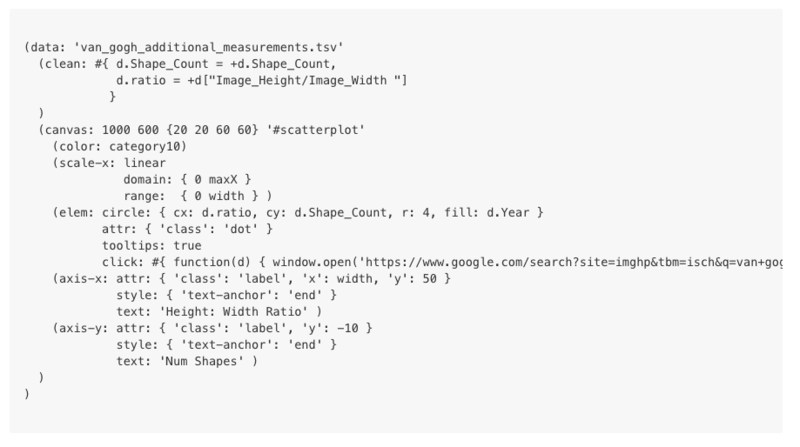 Building on experiments with ASTs in Tree Please and data projects, Data Monster is a domain-specific language that transpiles to d3.js files (plus some helper HTML and CSS files, if necessary). It was designed to replace the need to type boilerplate d3.js code with a LISP/JS mashup syntax that specifies the necessary values. The parsing code was a fun chance to play with a functional JS style that I loved. Data Monster was my primary project at Hacker School (now known as Recurse Center).